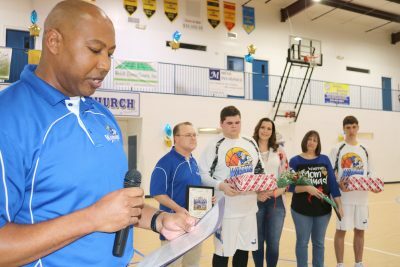 Ruskin Christian School Warriors honored a pair of seniors and their parents at halftime of their 58-48 victory over Brandon Academy Monday. Basketball coach Micah Bonner saluted seniors Dylan Northrop, left, and Noah Statham along with their parents Paul and Jennifer Northrop and Latrelle and (not pictured) Charles Statham. The RCS Warriors ended regular season play Tuesday and open conference playoffs against a yet-to-be named opponent Friday night, hopefully at the Ruskin school. The Ruskin Christian School (RCS) had their four-game winning streak snapped last Friday as the Warriors wrap up the regular season with two games this week, and wait for the playoff schedule in the Florida Christian Western Conference. Jesse Mobley, #24, goes up with for a RCS bucket against Citrus Park as #15 junior Conner Kick brings support. Coach Micah Bonner’s squad had a case of over-confidence and sub-par performance Feb. 1 as they hosted the Citrus Park Eagles, a team RCS bombed 64-35 in mid-December. But the visitors from Tampa shocked the Warriors and the crowd in the RCS gym by coming from behind to nip RCS 51-47. 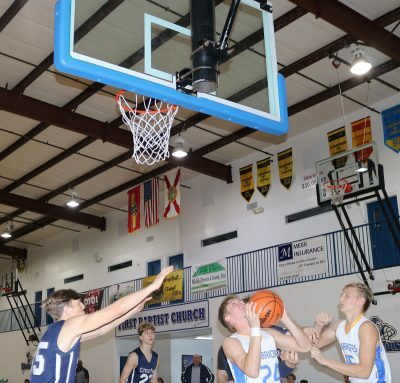 It was only the second home loss of the year for the Warriors who fell to 14-4 overall and 10-3 in conference as they head into a Feb. 3 Seniors’ Night game against Brandon Academy and a Feb. 5 match on the road with Community Christian of Bradenton. The Warriors looked sluggish but took an early lead over Citrus Park before the wheels came off due to poor shooting and turnovers by RCS. The visiting Eagles capitalized on seven of eight, shooting at the charity stripe to nail down their upset win. In the early-week game, RCS blew out the Calvary Baptist Academy for their fourth-straight victory 70-21 as Bonner and Paul Northrop cleared their bench. Freshman guard Sam Tuch registered 16 points; junior Jesse Mobley and sophomore Caleb Statham contributed 13 each.